You need to be logged in to view your Download ID! In order to receive updates within any of our extensions you need to enter your Download ID within each extensions Global Parameters area. Below we have outlined each stage that you will need to go through in order to enter your Download ID. Within all of our extensions there is a 'Global Configuration' button within the main Control Panel view of the extension. This allows you to manage multiple 'component' settings all in one place. You will first need to navigate to 'Components -> DMC Extension' within the administrator area of your website. 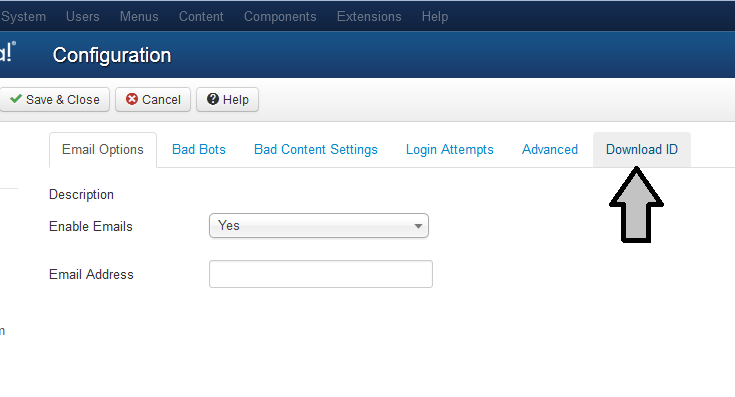 Once there click the 'Global Configuration' button under the extensions title, you will then be taken to Joomla's 'com_config' component with all of our extensions settings available to you (infact, you will be able to access every extensions global parameters). You then need to click the 'Download ID' tab to enter your Download ID. Once entered simply click the 'Save' (or 'Save & Close') button and Joomla will store the your Download ID against our extension allowing you to receive the latest updates when available.